We have found a unique spot in Door County where the entire family can have a great old time in the beautiful setting at Plum Loco Animal Farm! We met with the owners Linda Steiner Pascascio, and Jeremie Pascascio. In 2016, Plum Loco celebrated its 10th anniversary of welcoming local and visiting families to its Farm-Animal Sanctuary and Play Farm Village located in Egg Harbor, WI. Plum Loco remains committed to providing a relaxed, enjoyable and engaging experience for every human, and non-human, being. This is a unique and wonderful environment. This is a farm tucked away in a quiet section of Door County, where it is peaceful, and just surrounded by land and more land. We have visited the farm several times, and it continues to get better and better. There are all kinds of things to do on the farm, including petting the animals, feeding carrots to ponies, horses and donkeys or grains for the sheep, pigs and goats . . . and lots more! There is a play-farm too for toddlers up to 8 years old. And there are plenty of places for the adults to relax and enjoy their children playing lawn games (for older children and adults), board games, puzzles, and in the Play Farm Village! And Plum Loco Animal Farm is also handicapped accessible. Read more! It's not really a petting zoo in the traditional sense. Their mission statement says: "Our mission, at Plum Loco, is to provide our animal family with a safe and loving home for the duration of their life spans." Each has a name, personal history, and unique personality. In most cases, each has been raised with its family herd. And while baby animals are naturally cute, cuddly, and entertaining, they inevitably grow into adulthood. Therefore, you may not always see baby animals at Plum Loco. You may encounter aging seniors as they live out their lives in peaceful retirement. And while most are adults, rest assured, they are all young at heart. Here at Plum Loco, our goal is not to maximize consumer dollars, but rather to maximize the comfort and quality of life of our precious animal family as they live out their natural life spans. Sound totally crazy…? Perhaps. But it is with this vision in mind that we welcome you to share a relaxing and enjoyable experience at this animal farm we call home. We welcome you…to Plum Loco!" Yep. People thought they were kind of crazy to do this, and hence the name, Plum Loco! But the Plum Loco Animal Farm, begun in 2006, is going strong! It's crazy good in our opinion! Plum Loco Animal Farm really is a special place. This really is an active place, where kids have lots of fun, and parents can enjoy a moment of relaxation in the shady gazebos, or walking with their kids about the farm. With about 60 animals, the farm is interesting in itself, but with all the other activities, this place is unlike any other we have seen. We saw Shetland ponies, Nubian goats, several different breed of sheep, pigs, turkeys, horses, donkeys and more. And yes, you can pet all the animals, and purchase feed from the ticket booth. Next door to the Diner is the Plum Loco Country Vet Clinic - where little animal doctors can examine and treat a variety of stuffed animals. There's plenty of medical equipment and even a few kennels for those pets that need to check in for a longer stay. 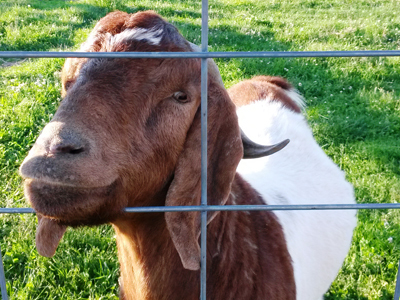 The 60+ animals are only half the attraction at Plum Loco Animal Farm. 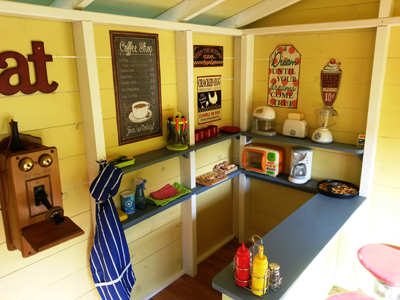 Many parents and grandparents spend hours relaxing while the children explore the child-sized Play Farm Village complete with a scaled-down farm house equipped with a fully-stocked kitchen, garden and laundry wash line. 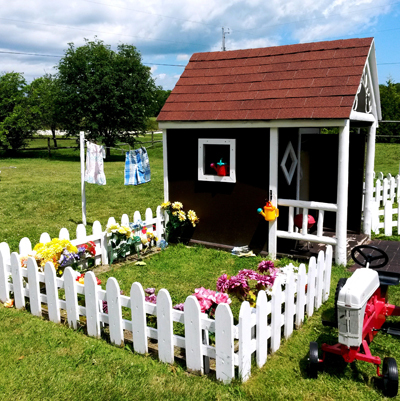 The barn contains landscaping equipment, tool bench, pedal-tractors, gas pump, wheel-barrows and corral with plush horses the children can ride and brush. 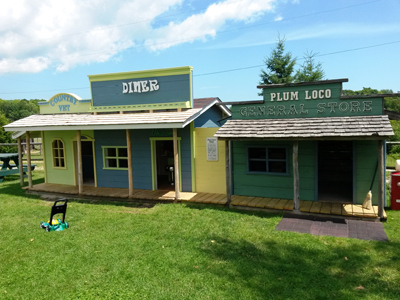 The latest addition to the play-village is the 1880's style General Store complete with a farmer's market stand, cash register, shopping carts and items to buy and sell. The Play-Farm Village is a role-playing wonderland for children ages toddler - 8 years where young imaginations can engage in authentic, child-sized buildings - stocked full, with hands-on equipment and activities. They have developed a play area in the "old-west" town motif. They have added a 50s Style diner and Country Vet- Clinic! Once completed, the town will offer the Plum Loco Soda Saloon, Barber Shop - great spot where children can expand their imaginative role-play. Future plans include the addition of a School House and Silo-Slide to complete the play farm village," Linda told us. 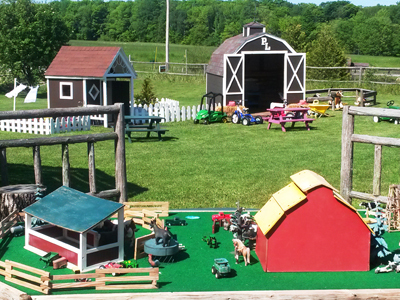 The play-farm also provides an 8 foot farm-table with animals, barns, tractors, silos, etc. for more creative play. The kiddy-corner offers a variety of animal and farm related books, puzzles and coloring for young ones. This is a well thought-out environment, that offers kids and adults alike a unique experience. 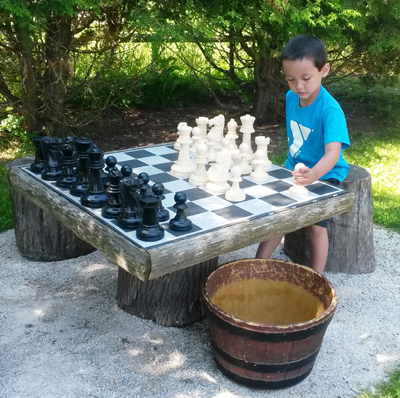 At Plum Loco Animal Farm, you will also find a variety of lawn games, puzzles, reading material and board games. In addition, purchase a feed-pail full or carrots and head out to see the ponies, horses or donkeys who just love eating the carrots right from your hand. Or how about nice healthy grains to feed the goats, sheep and pigs? The animal feed, as well as people feed like fresh popcorn, cold drinks (pop, bottled water, juice boxes), packaged snacks (like chips etc. ), freeze pops, and other goodies like toys, t-shirts and sweatshirts can be purchased right at the ticket booth. "People are encouraged to bring their own food (coolers, etc). During business hours no alcohol - but if you reserve the facility for your own private function, you can even bring grills to cook-out, alcohol, lawn games, etc.," Linda told us. Plum Loco offers a very nice picnic area, with cedar-log gazebos and lots of seating. 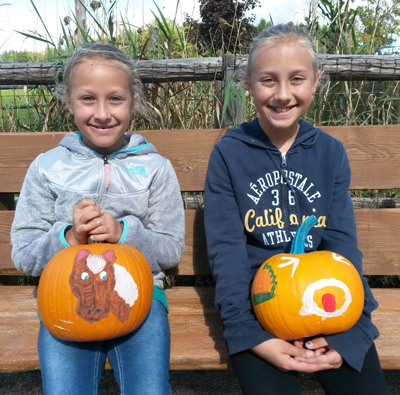 In the Fall, when the air is crisp and cool, Plum Loco Animal Farm sells pumpkins, and even offers pumpkin painting amidst their festive Fall decorations. 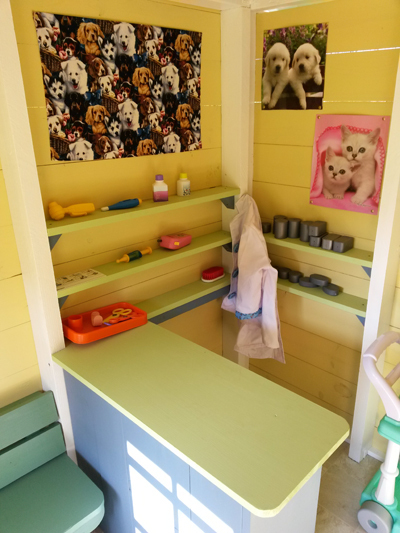 Linda told us that Plum Loco Animal Farm also hosts birthday parties and special group events, and that the facility can also be rented after hours for private gatherings (birthdays, family reunions, field trips etc.). Give them a call to check out how to create a truly wonderful birthday experience for that special someone! Or what a unique field trip this would be! The owners of Plum Loco would like everyone to know that, although you can pet and feed the animals, Plum Loco is not a "petting zoo", in the traditional sense. The mission at Plum Loco is provide a safe, permanent and loving home to farm animals for the duration of their life spans. Plum Loco animals are not considered "livestock" and will not be bred, milked, ridden or consumed. How To Find Plum Loco! Plum Loco Animal Farm is in Egg Harbor, on the south end of it north of Carlsville. Off of Highway 42, turn East onto Plum Bottom Road, and just follow the road for about 3 miles. From the east (lakeside), they are 4 miles west of Highway 57 (Jacksonport) on County V.
Open Memorial Day Weekend to Labor Day, 9:30 - 4:30 daily (closed Wednesdays), and Labor Day - November 1st 9:30 - 4:30 Saturdays and Sundays only. Of course, weather permitting. So don't be crazy - whatever you do, find them! Plum Loco Animal Farm is an experience that will thrill you and your young ones, and will prove to be a very fun outing for half a day or however long you want to stay! Any age will enjoy the day here at Plum Loco Animal Farm. DoorCountyNavigator.com loves it, and please tell them that we sent you!